My Yute Soccer educates youth in the sport of soccer and promotes awareness of socio-cultural differences for the general public. Sparkes noted that fees for participation in local soccer clubs is prohibitive for many families and access to experienced coaches is limited. So he started by enlisting help from his fellow adult league players to set up a free soccer camp for Oakland, California area youth from diverse socioeconomic backgrounds. He quickly got a group behind the idea and they began at a grassroots community level, raising money through t-shirt and hat sales as well as pledging their time as volunteer coaches. 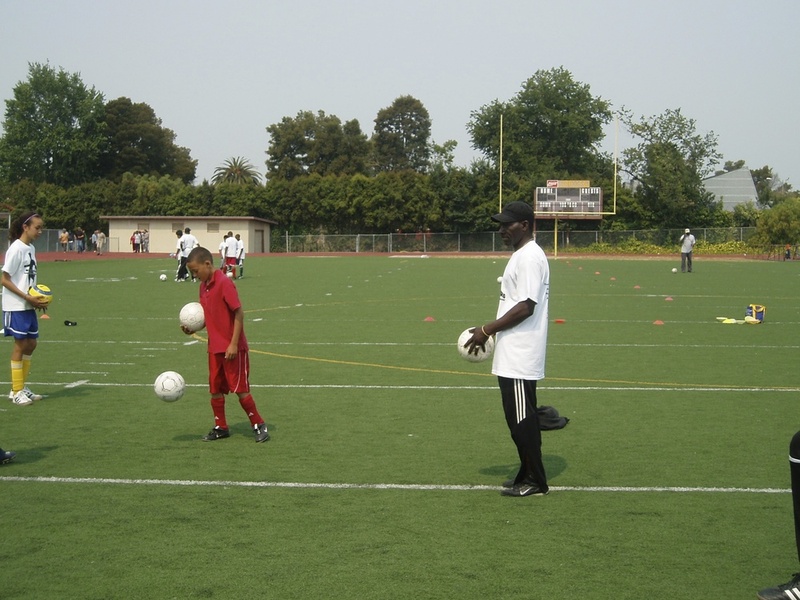 The first soccer camp took place in summer 2008, MYS became a registered 501(c)3 in November 2008, and has since earned an East Bay Express Best of the Bay award 2010 and the Oakland Innovator’s Award 2011. MYS, with help from the community and local sponsors, has provided free soccer camps to 247 children since 2008 with experienced and talented players and coaches. In 2011, after receiving the Oakland Innovator’s Award, MYS “popped up” in schools across Oakland, California, and provided free mini camps for over 60 children and its first paid internship opportunity for mentors. My Yute Soccer is a CA registered 501(c)3 organization. Rovel S. Sparkes, President & Founder, has fond memories of soccer in his neighborhood–not only an opportunity to share his skills and talents as a player but also as a vehicle for building community. 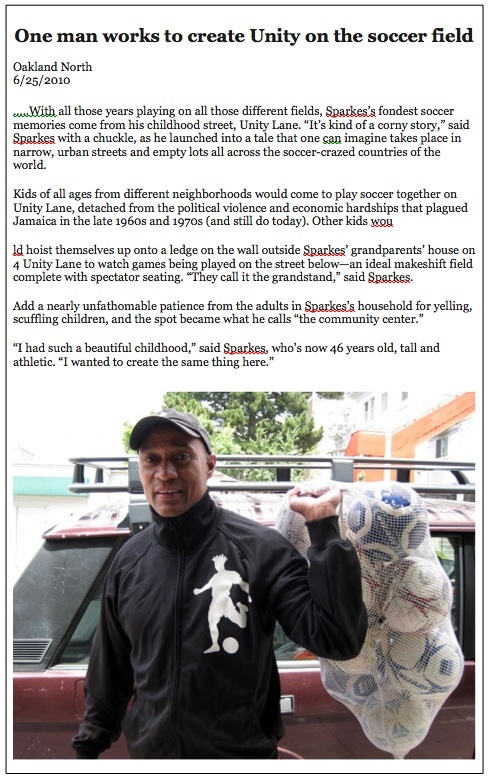 As reported by Jill Repogle in her 2010 article, One Man Works to Create Unity on the Field, I had such a beautiful childhood’, said Sparkes, who’s now 46 years old, tall and athletic. I wanted to create the same thing here. On a long flight back to California after watching the 2006 World Cup in Germany, he decided to do it. He went to his fellow players at the Africari Soccer Club, and asked them to help him set up a free soccer camp for East Bay youth. He quickly got a group behind the idea and they began raising money, through t-shirt and hat sales. The first soccer camp took place in summer 2008 and MYS became a 501(c)3 charitable organization in November 2008. 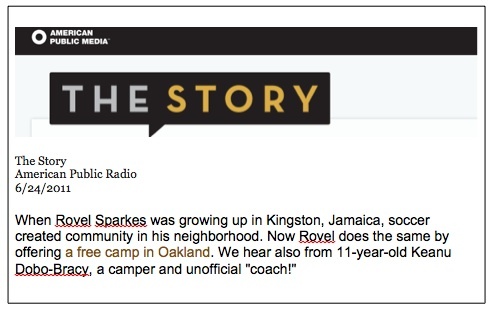 Sparkes spearheaded and continues to grow and manage the yearly Jamaican Jerk Cook Off Benefit Fundraiser for MYS, he directs the coaching team and the overall camp, and continues to be a tireless MYS evangelist in the local and international community. Most recently, in June 2018, Mr. Sparkes was awarded a Certificate of Special Congressional Recognition from Barbara Lee for "dedication and contributions to Caribbean-American heritage and culture." Sparkes also continues to play soccer in the East Bay Senior Soccer league for Africari. Joanne C. da Luz, Board Member & Co-Founder, is an MBA graduate of the Lorry I. Lokey Graduate School of Business at Mills College, recipient of the Goldman Sachs Initiative for Women Scholarship Award and the Career Development Award from the American Association of University Women. Joanne's experience with youth stems from a career as high school math teacher and Academic Director of 17 years. Utilizing her Master's degree in Education from Stanford University, Joanne oversees MYS educational programming. As Board Member and Co-Founder of My Yute Soccer, she directs strategic partnering, marketing and fundraising, supports collaboration with stakeholders and business groups to promote My Yute Soccer as a social enterprise within the Oakland community. She is also an NCAA Women’s Soccer Champion and has coached and trained youth in the sport. Although now retired from playing, she enjoys watching the beautiful game with family and friends. Adam Lamoreaux, Director, is a founding member on the Board of MYS. Adam’s objective is “to never stop pursuing work and activities that broaden my perspectives, guide my travels, and maintain my passion for everything good in people and nature,” leading him to become an integral part of the formation of My Yute Soccer. Adam is currently the owner and brewer for Linden Street Brewery, the only craft brewery in Oakland, CA. His love for soccer came from travels as a brewer and Navy man, earning a Navy Achievement Medal for Leadership. Adam’s genuine love for Oakland, coupled with relentless pursuit of all things entrepreneurial, are qualities that support MYS fundraising and programming initiatives. Polly Legendre, Secretary of the Board, is the first American to graduate from the Ecole Supérieure de Cuisine Française, and cooked for nine years in Michelin-starred kitchens in Paris. After Paris, she returned to her native Northern California where she founded La Gourmande, a private chef service, and taught at the California Culinary Academy in San Francisco before joining CleanFish in 2007. At CleanFish, Polly put her culinary know-how to work as an educator, spokesperson and program implementation specialist. In 2011, Polly co-founded Polished Brands, to bring ideas & energy to the good food movement through a full range offering of creative and strategic branding services. Polly has provided catering services and nutrition guidance for MYS on a volunteer basis since 2008. She joined the MYS team as Secretary of the Boad in September 2012. She is also providing key support “polishing” the MYS brand. Joshua Glassel began his work on the MYS Advisory Board as the Vice President of Acquisitions and Programming for Fox Sports Media Group. A skilled negotiator with an extensive network of international industry contacts, Mr. Glassel was part of the team that secured multi-year broadcast rights for the UEFA Champions League. As a member of the Fox Sports team since 1997, he held a number of positions within the network including Programming Director for both Fox Soccer Channel and Fox Deportes. Mr. Glassel is from San Francisco/East Bay and attended UC Santa Barbara. He played soccer throughout his life and continues to make it not only his job, but also his passion. Michael (Coach Doc) Lee is a soccer-loving Professor at the California State University East Bay where he focuses on issues related to Sustainable Development. Active in the East Bay community and beyond, he strives to be a change agent for youth and the community in general. He is fluent in Spanish and has lived, worked and traveled in over 30 countries across six continents since leaving his native England. He is a researcher and consultant with 20 years experience as a full-time educator. 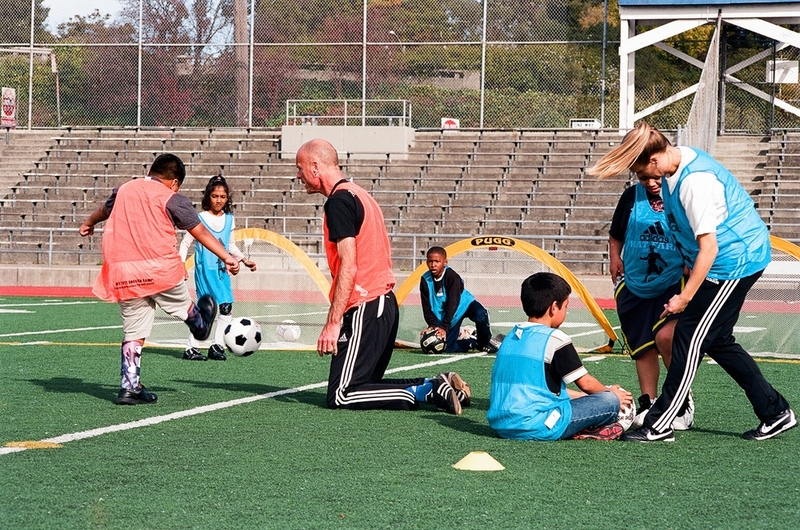 He has been coaching youth soccer for a decade as part of the Oakland and Piedmont Soccer Clubs. He is also a grade 8 USSF referee. Both of his children have been Teen Mentors for My Yute. He is an active player on the AfriCari soccer team that provides the foundation for MYS volunteer coaching. Horatio Sparkes, is Principal at The Yucaipa Companies, responsible for business development, marketing and investor relations. Prior to joining Yucaipa in 2006, he was the NYC Deputy Comptroller for Pensions, where he served as a trustee on the boards of six public pension systems and served as the Executive Director the York City Board of Education Retirement System between 1994 and 2001. He is the recipient of numerous awards in the pension and investment industry, including Trustee of the Year Award for his continuing efforts in leveling the playing field to enable minority and women’s investment firms to compete. In 2003, Horatio was inducted in the Wall Street Hall of Fame by the National Association of Securities Professionals. He has been a fan of My Yute Soccer since its inception and provides key advice, focusing on big picture initiatives and international expansion. When Mr. Sparkes is not working, he is enjoying family time, cooking, and watching Arsenal, his favorite team. Mr. Carey Thomas, Principal for Skyline Exhibits, is an avid soccer player, fan and team manager for Club Africari. Active in the Oakland community, Mr Thomas provides volunteer hours as advisor, coach, and team manager for his church community, the Montclair Soccer League, Africari, and My Yute Soccer. As a lawyer and former law professor, Mr. Thomas provides essential advice for MYS programming and growth initiatives. But most importantly, Mr. Thomas is most inspired by serendipity and the camaraderie provided by the MYS experience. Thanks to our dedicated coaches and local community, My Yute has been able to provide free soccer camps to 250+ children since 2008 with experienced and talented players and coaches. Each My Yute coach volunteers an average of 94 hours per year. My Yute has supported the coaching volunteers who are interested in improving their practice, forming strategic partnerships resulting in grants and advancing coaching with support for clinical training. Remember when you could just go down the street and play? Those days when you had to mark your goal post with a sweatshirt, a shoe or a hat? When scoring really meant negotiating what a goal was and you had to debate every foul? Children around the globe have this shared experience - the experience of play. 2018 - Founder, Rovel Stephen Sparkes, Certificate of Special Congressional Recognition by Congresswoman Barbara Lee "In recognition of your contributions and dedication to Caribbean-American heritage and culture." Listen to The Story to hear first hand how and more importantly why the camp was started. Learn more about MLS Works. Read the full article at Oakland North. Read the full article at rucked.